The Hull & East Riding Karate Academy is the region’s only 5 star fully accredited karate academy. With karate clubs based in Leven, Bilton and Victoria Dock we specialise in teaching traditional Shukokai Karate plus the very best in Competition Sport Karate. Not all of our students want to compete in competitions, some just enjoy learning karate, making friends, having fun and building confidence but we do produce more national karate champions than any other karate club in the region. However, the good news doesn’t stop there! As the region’s premier karate academy we are fully committed to helping to raise the standards of the academic achievements of all of our students. This is where the Hull & East Riding Karate Academy is hitting new heights and setting new standards in the sport of karate in the UK, with our totally unique karate grading syllabus books and certificates of achievement for Sporting Excellence in Competition Sport Karate. You will be taught by the award winning Karate Coach, Sensei Wayne Clarke 3rd Dan. 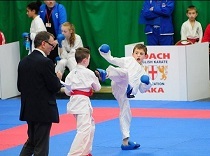 The former karate champion and East Riding of Yorkshire Sports Coach of the Year Award-winner is a fully qualified English Karate Federation accredited coach. He is also the region’s most successful karate coach and he has been producing karate champions throughout Hull and the East Riding of Yorkshire for the past 25 years. We specialise in teaching the very best in Competition Sport Karate, including Kumite (fighting) and Kata. This includes Individual Kata, Pairs Kata and Team Kata and we now produce more national karate champions than any other karate club in the region. We have national champions in every age group starting as young as 7 years old training at our Leven Club, Bilton Club and Hull Club, so you can rest assured that your child is training with some of the best karate kids in England and is being taught by one of the best karate coaches in England. Our certificates provide an official record of outstanding achievement in Competition Sport Karate for all students who have represented the Hull & East Riding Karate Academy. Older students may wish to show them to prospective employers, use them to enhance CVs or job or university applications. They are available for both current and past students. There are four different levels of certification in Sporting Excellence, ranging from Grass Roots Level to Regional Level, National Level and English and British National Level, depending on which competitions medals were won at. Our totally unique hard back Karate Grading Syllabus books have been specifically designed and developed to work in partnership with all Hull and East Riding Schools and Colleges. These books contain a special school report section that must be signed by the student’s school teacher before each karate grading. If the student gets a ‘poor’ school report they cannot take their karate grading examination, which means they cannot progress to their next belt. We use the very latest electronic impact measuring equipment, so that you can visibly improve the speed & power of your punching and kicking techniques. Safeguarding and protecting children in sport is of paramount importance and the good news for you and your children is that the Hull and East Riding Karate Academy has gained accreditation with both the Hull City Council and the Humber Sports Partnership. This ensures that we have the highest standards of welfare, safety, equality, coaching and management in place. An accredited club is also recognized as a safe, rewarding and fulfilling place for participants of all ages, as well as helping parents and carers know that they’re choosing the right karate club for their children. Have fun and be THE BEST! You will also have GREAT FUN & MEET NEW FRIENDS at the Hull & East Riding Karate Academy.